Recover deleted pictures and restore corrupted photographs with C-photo Recovery. Super Search technology guarantees the best results by scanning your entire hard drive or memory card for signatures that mark the beginning and end of digital pictures, and matching the result scan with file system records. All popular image formats are supported. Your pictures can be recovered even if you shoot RAW with a digital SLR! 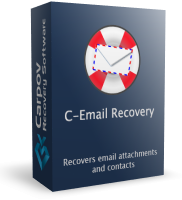 Recover email messages and entire databases, created in the most popular email clients with C-Email Recovery in a fully automatic mode. Accidentally deleted email message will be resurrected within a second along with the attached files. In a case of HDD failure full databases can be recovered together with Outlook contacts and Windows Address book. Features full preview and export functions. 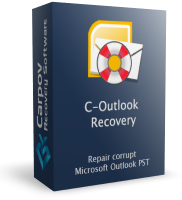 C-Outlook Recovery automatically undeletes, recoveres and fixes individual email messages and entire PST and OST databases, created in all versions of Microsoft Outlook. All Email data will be restored together with attached files, contacts and organizer entries. It fixes damaged databases, without modifying tables content. Repaires PST files, exceeding 2GB by splitting them into smaller ones. 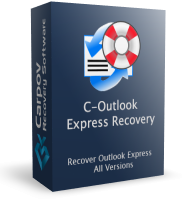 C-Outlook Express Recovery automatically undeletes, recoveres and fixes individual Email messages and entire DBX databases, created under Windows Live Mail, Vista Mail and Outlook Express with unprecedented speed and quality. All Email data will be restored together with attached files and repaired, if needed, just within minutes, even if your hard disk is damaged, formatted or inaccessible in Windows. C-Uneraser recovers any file or folder. Erased or lost after a system accident. Its capabilities range from simple undelete operations to comprehensive data recovery from damaged, corrupted, formatted and inaccessible hard disks. Supporting all types of files and all kinds of storage media, C-Uneraser successfully recovers deleted files from hard disks, memory cards, USB drives and other storage devices formatted with all types and revisions of FAT and NTFS file systems.